Do you have to hard code slide numbers to display in the actual slide now or footer or is there an easier way? I know how to make it display in the Outline menu. Hi Amy! The Player for Presenter 13 has been updated to have the same player across all the Studio products. You'll find the options for how to update and customize the player here. 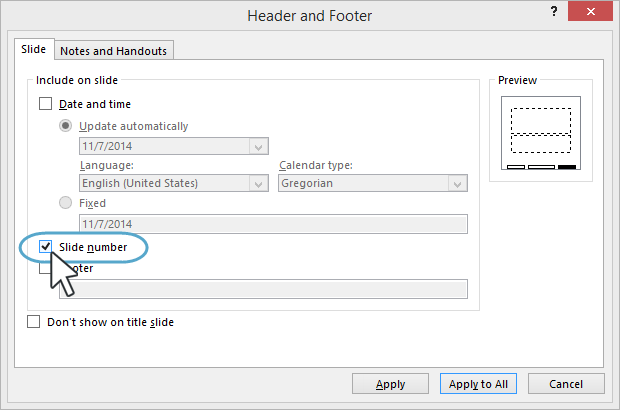 You can still add a slide number following the normal Powerpoint insert -> Slide number. Hi, Leslie! I have tried to add slide numbers to my powerpoint 13 file. The one time I tried to add them, it deleted the few slide numbers that were in the pptx/ppta. I've gone into the master and I still can't get the slide numbers to appear. When I play the module, there are no slide numbers. I went through the entire player tutorial and there is nothing about slide numbers even though it's in your response. Help!! My people use and need slide numbers and the Articulate frame is keeping Powerpoint from acting normal. I can't imagine that presenter would keep the slide number invisible from my view. Go to the View tab on the PowerPoint ribbon and click Slide Master. Go to the Insert tab on the ribbon and click Slide Number. Mark the Slide number box and click Apply to All. You'll need to apply that slide master to all your slides for it to display. Hope that helps! "Hi Lisa, The link Leslie shared was about the slide numbering with..."